Last night, guests celebrated the Maison’s 27th Edition of the Montblanc Arts Patronage Awards honoring Laura Donnelley, the co-founder of Art Matters. Donnelley is among 17 patrons across the country to receive the visionary award for her outstanding personal commitment to supporting the work of young and emerging artists and under her leadership, supporting Art Matters in distributing over 2500 grants to US artists for fellowships and collaborative projects all over the world. Montblanc, the global luxury brand is applying the mission of the Montblanc Cultural Foundation through philanthropic activations. 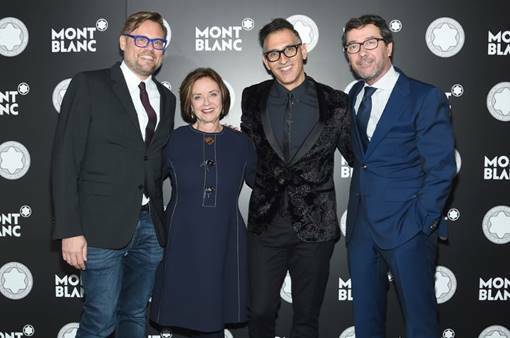 Guests included Sylvain Costof (President, Montblanc North America) Chairmen of the Montblanc Cultural Foundation, Sam Bardaouil and Till Fellrath. Till Fellrath presented the visionary award in front of an intimate crowd of New York’s art notables in one of Manhattan’s most exclusive properties – the home and private studio of artist Izhar Patkin. Guests enjoyed music by Matty D and the opportunity to view Montblanc’s 2018 Patron of Art 4810 limited-edition writing instrument, which was later presented to Laura Donnelley during the presentation which included a live performance by singer/songwriter and Art Matters artist –John Kelly.